ON POINT: Captain Chanyn James and the Blue Brigade officers perform in the shows opening number “Let’s Go To The Movies”. 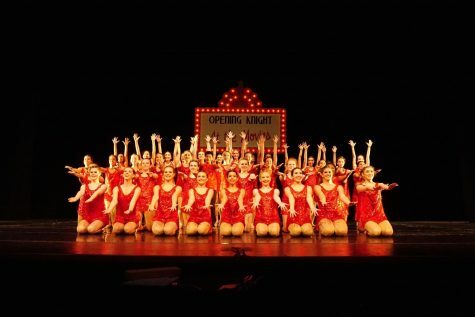 The shows opener was one large dance that contained different small dances within it, showcasing different groups such as the team officers and different grade levels. Photo by Risa Darlington-Horta. AT FULL STRETCH: Sophomore Matthew Vargas performs his award-winning solo to “I’ll Never Love Again” as the audience bursts with cheers and applause. At the Westwood Competition in February, Vargas achieved a near perfect score of 199/200 with this dance, ranking first in his division. 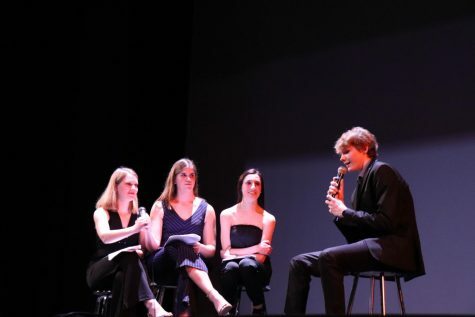 ”To be able to showcase my solo to the school was a really amazing experience, sometimes I feel like people underestimate me and to be able to show what hard work I have put in feels amazing,” he said. Photo by Madelynn Niles. DANCE DADS: The Blue Brigade dancing dads perform duets with their daughters during both nights of the show. 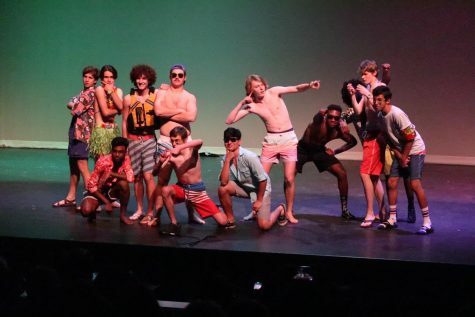 The BB Dancin’ Dads is a tradition during the spring show every year. Photo by Madelynn Niles. FLASHY FINALE. The 2018-19 Blue Brigade poses at the end of their spring show. The performance was quite emotional as the senior members were dancing together for the last time. “It was really surreal. I had spent the last three years watching the other seniors dance their dolo part and never thought that my time to do that would ever come,” senior Sophia Salo said. “When ever I listen to last dance, I will always remember the dance and my amazing experience on Blue Brigade.” Photo by Caleb Melville. STRIKING A POSE: Maddie Cevallos extends her arms as she performs her “Senior Solo”, a tradition that has been around at MAC Blue Brigade for many years. It was an emotional night for the senior members, as it was their last performance with the group. “It was bittersweet. I was happy to close out my last year on Blue Brigade by performing my solo that I worked hard on. But it was also very sad realizing that that was my last time ever dancing.,” Cevallos said. Photo by Madelynn Niles. UP AND COMING. Officers for the 2019-20 season perform their first dance together. The dance was to the tune “Dreamgirls” and was the same dance as they performed at officer tryouts. The 2019-2020 officers consist of Juniors, Addie Secker-Martinez, Matthew Vargas, Valentina Paredes, Andrea Paredes, and seniors, Lilly Brown and Amelia Paul. “I am so excited to lead the team next year as an officer because I have always loved Blue Brigade and I’m thrilled to get to share my love with the team as well as lead us to success as one big family,” sophomore Addie Secker-Martinez said. Photo by Caleb Melville. PRINCES OF PAGEANTRY: “Opening Knight at the Movies” Deron Gage and Gabe Williams perform their duet “River”, previously seen at the Mr. McCallum pageant where Williams won the title of Mr. McCallum. 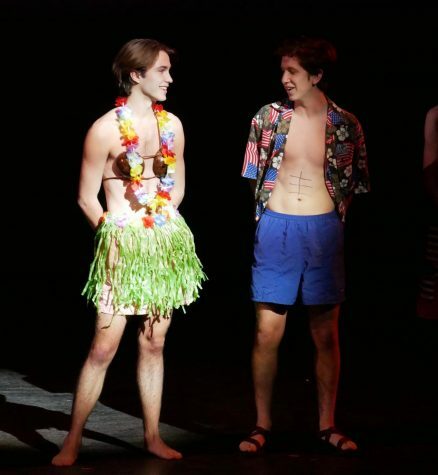 Both Gage and Williams, members of the Varsity Football team, were the MCs of the show. Photo by Madelynn Niles. FLOWER POWER: During the final performance of “Opening Knight at the Movies”, prior to the closing number “Last Dance” senior Ellie Stites gives her mom gives her mom a rose and hugs her during a bittersweet moment. As a senior, this was Stites last performance with the Blue Brigade. Senior members each perform a solo as their individual goodbye to the team. Photo by Dave Winter. 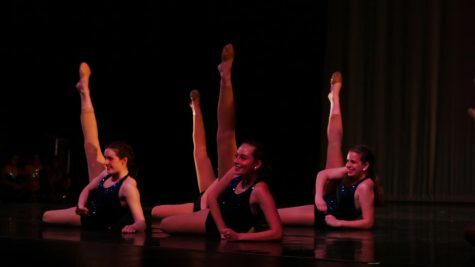 A LEG UP: Smiling brightly, Amelia Paul, Sydney Buford, and Ella Irwin perform their junior dance — a recreation of the pep rally performance to “Born this Way” by Lady Gaga. Each grade level was featured in their own showcase dance, alongside mass group dances and senior solos. “Working in a small group let us show off our skills in a fun way,” Buford said. Photo by Madelynn Niles. SPRINGING INTO ACTION: Junior lieutenant Amelia Paul does a back handspring. Paul and fellow junior Lilly Brown, who performed a duet together later in the show, will be the senior co-captains next year. Photo by Risa Darlington-Horta. South Congress, also known as SoCo to local Austinites, is home to Amy’s Ice Creams, Homeslice Pizza, and many other local hotspots. Whether you walk, drive, bike or scooter, SoCo is definitely worth a visit. BUILDING UP AND OUT- South Congress leads right up to the Capitol. 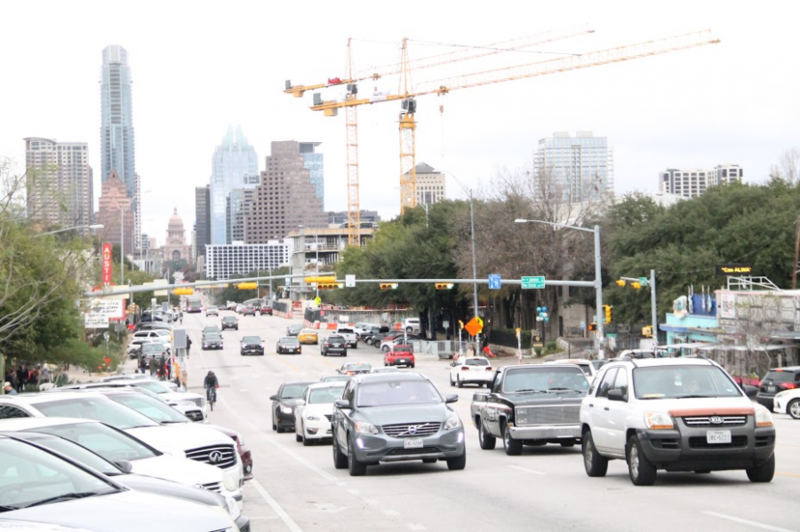 This means that whether you are renting scooters and bikes, driving, or walking, you are bound to get a great view of the ever-growing Austin Skyline. One of the tallest and most well known is Frost Bank tower, and the tallest building is The Independent, reaching up to around 690 feet. 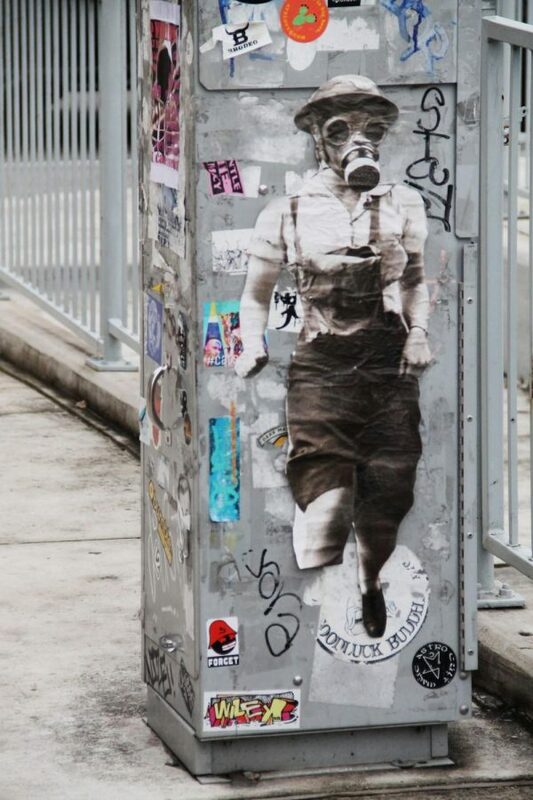 CREATIVE CULTURE- It’s no surprise that art is a huge deal in Austin. Whether you’re looking at paintings downtown at the Blanton, or exploring one of Austin’s many live music fests, you’re bound to be satisfied one way or another. 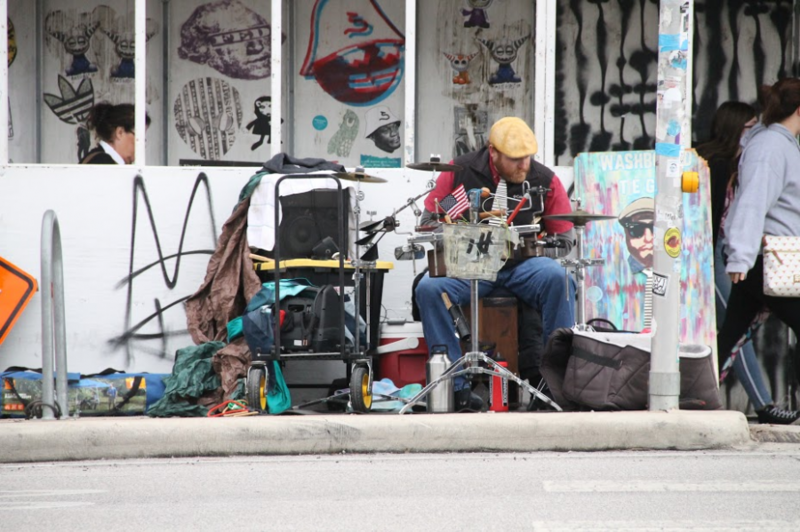 Local street musicians can be found up and down Soco, and each and every one of them is different. 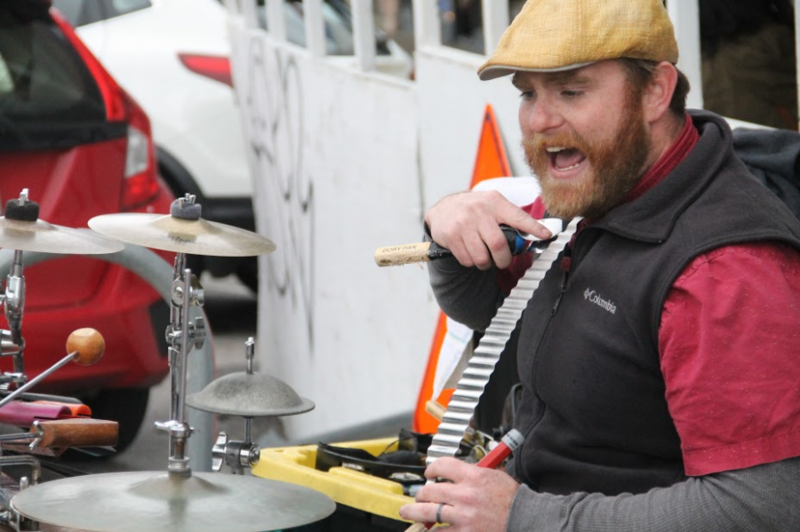 Above, street musician Rob Cook, also known as the “Washboard Tie Guy” as he uses a tie made from washboard as part of his music. 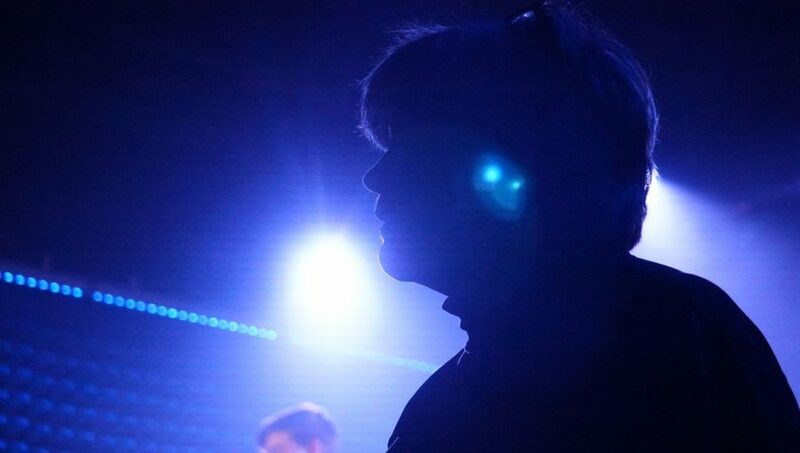 “I’ve been here [in Austin] for about two years, and before that was traveling the country, doing some music festivals,” Cook said. “It’s [Austin’s] got a great vibe, it’s got a up-and-coming Nashville kind of vibe, I love it.” You can check out Cook’s music, upcoming appearances, and more on Twitter, YouTube and Facebook, by following @washboardtieguy or by simply searching up “Washboard Tie Guy”. ELECTRIC ART- Not only is the professional art around Austin a big deal, there is plenty of free art down the streets. In fact, you will likely see Power Boxes covered with it. In this case, people have them covered with stickers, flyers, and a picture of a World War One worker. 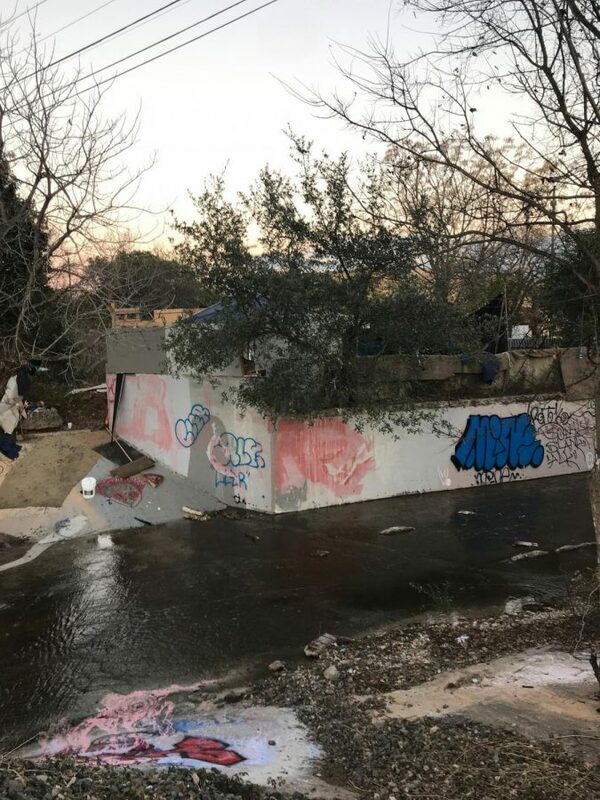 These boxes have also been covered with celebrity faces, local icons, and graffiti. MUSIC IS OUR JOB- Many street musicians around Austin play for fun, but for most it’s their only way of income. They will ask you for a tip, usually if you take their picture. 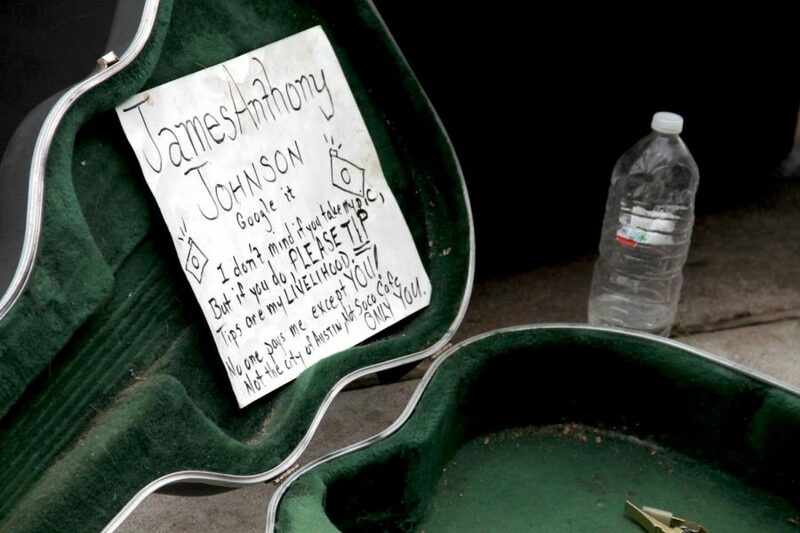 Local street musician James Anthony Johnson was not available for an interview at the time, but you can check out some of his music online, and of course you can always go to South Congress and find him outside of the Soco Cafe. 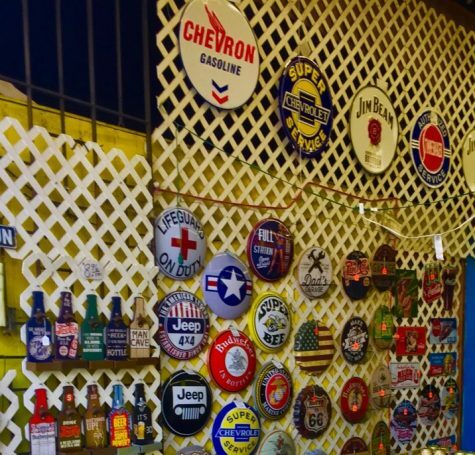 SOMETHING FOR EVERYONE- No matter who you are or where you go along South Congress, you will find all sorts of handmade goods. 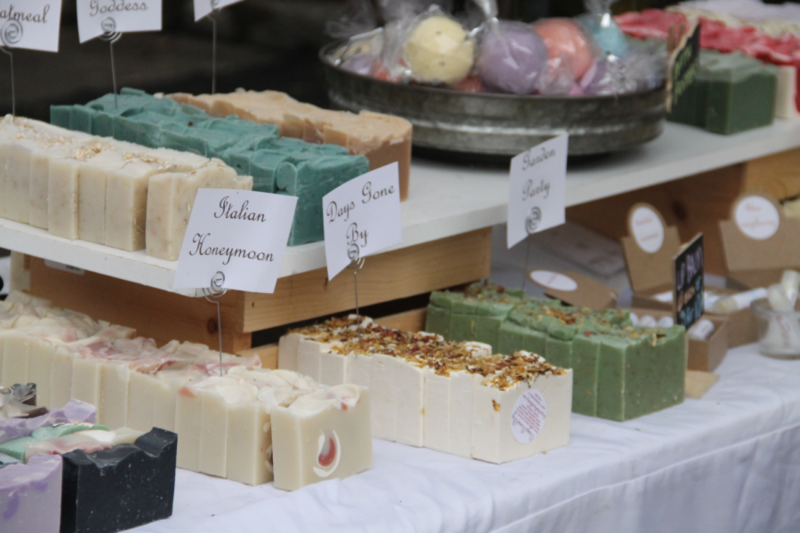 You can find soaps, like above, jewelry, artwork, and all sorts of little gifts. 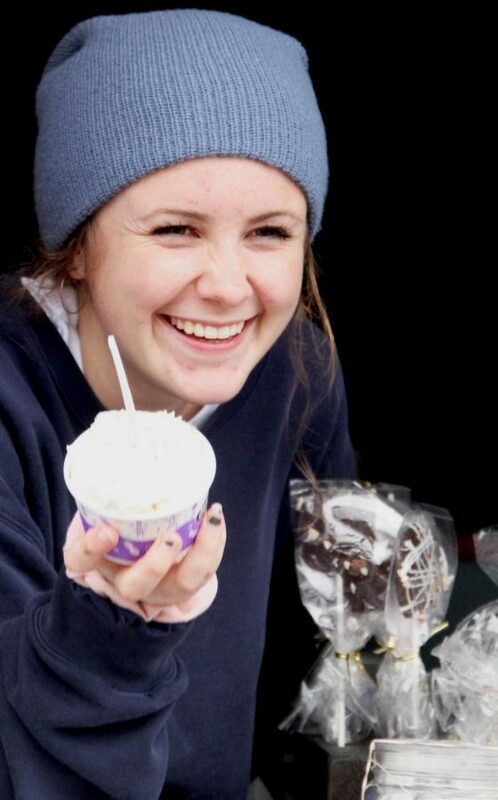 WE ALL SCREAM FOR ICE CREAM- Amy’s Ice Creams is a huge hit on South Congress, even when it’s 40 degrees outside. They always have a variety of flavors, and you can choose your own “crush’ns” to go in or on your ice cream. They also have seasonal flavors and treats. Some people mix it up every time they go, and others stick to one thing. “I usually get the Mexican Vanilla with sprinkles,” said local Austinite Lauryn, shown on left. CUP O’ JO’S- Local coffee spot, and home to the “i love you so much wall”, Jo’s Coffee is an Austin Favorite. 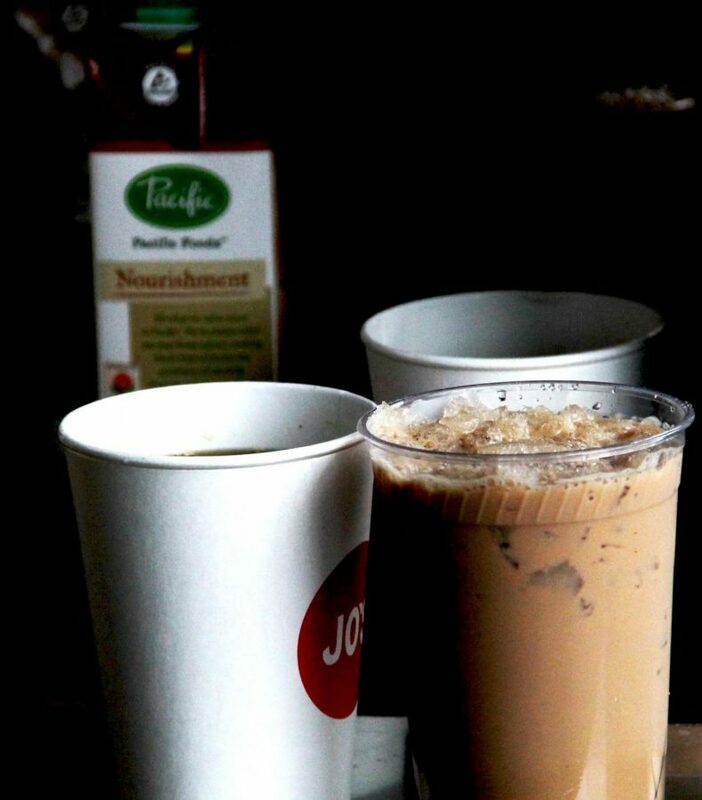 Founded back in 1999, Jo’s serves hot and cold drinks, as well as a variety of food. The line can sometimes get long, but nearly all Austinites say that it is worth the wait. YOU’VE BEEN SERVED- Amy’s Ice Creams can be found at locations throughout Austin but whichever location you choose, whether it be on Burnet, South Congress, the Arbouretum, or elsewhere, you are bound to be greeted with smiles and fun. Amy’s is known for their amazing tricks when making their ice cream, and every year they host the “Trick Olympics” where the best scoops (ice cream servers) compete against each other to see who can show off the most ice cream scooping skill. At the area competition on Saturday, the winter guard capped off the most successful competition season in its three-year history by finishing first place in its division for the fourth competition in a row. Not only did the guard earn Gold at the area competition, it also earned its highest score of the season and the highest score of any guard competing in area competitions across the state. Since it is not a state year for the Mac winter guard, the area competition marks the end of the yellow brick road for the guard and its four senior members: Claire Rudy, Sydney Bunce, Helena Sandberg and Emily Freeman. All of us at MacJournalism congratulate the guard on all of its successes this season. We dedicate this #TuesdayTop10 to the team and its historic season. The annual spring dance show, “Momentum,” performed by the McCallum Youth Dance Company, was a debut for many dancers and a farewell spring concert for others. For sophomore Aydan Howison, in his first year as a dance major, the show was his debut performance. Howison participated in multiple genres of dance in this performance, such as Flamenco, modern, and contemporary. 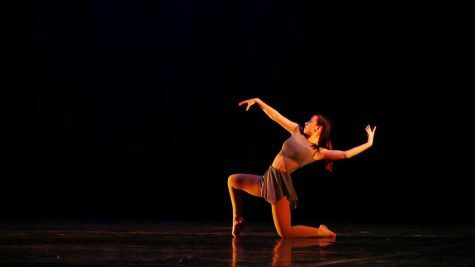 While Howison and his fellow Emerging Dance Troupe members made their first spring concert performance, the senior members of the Pre-Professional Dance Company made their last. For senior Chloe Shields, Saturday night was her last performance dancing in the spring dance show with her company. Shields has participated in the McCallum dance program as a major for all four years of high school. We are pleased to share some of our favorite images from this weekend’s performances as our #TuesdayTop10 photo essay for this week. 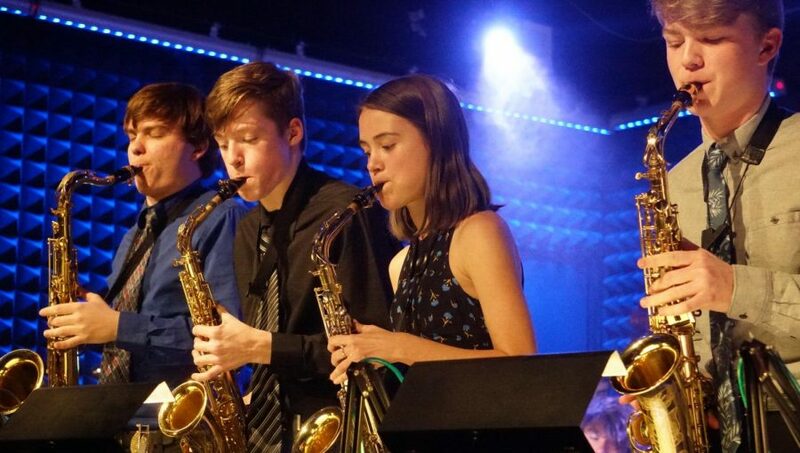 Members of the jazz band had the opportunity to play Sunday night at the packed Parker Jazz Club on Fourth Street, a prestigious club known for its incredible music. 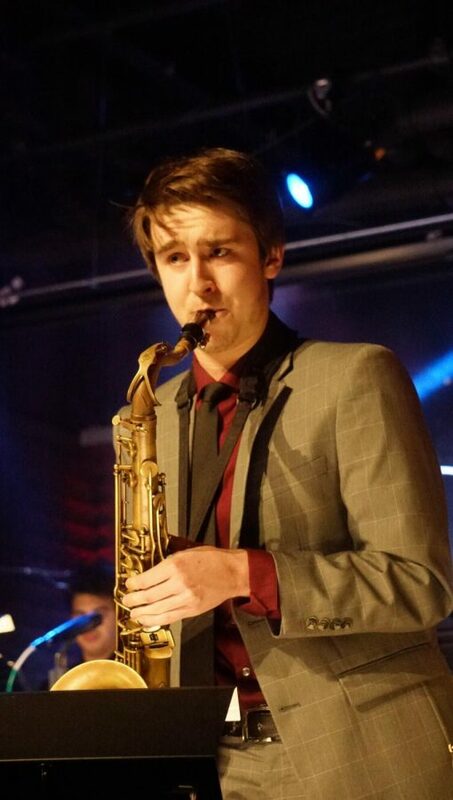 Along with raising more than a $1,000 for the jazz band program, the members also got the chance to play with the owner of the club, Kris Kimura, and professional saxophonist Joe Morales. 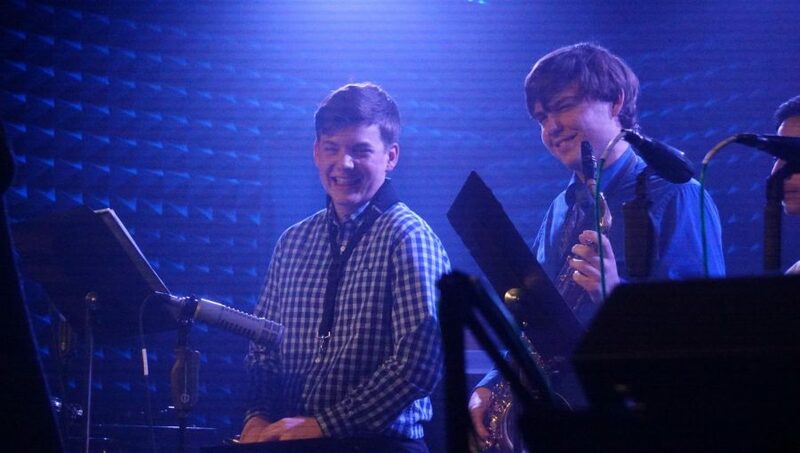 Solos, famous tunes and a combo feature brought the audience members to their feet with a standing ovation for the “best jazz band MAC has seen in years,” as director Carol Nelson described her students. 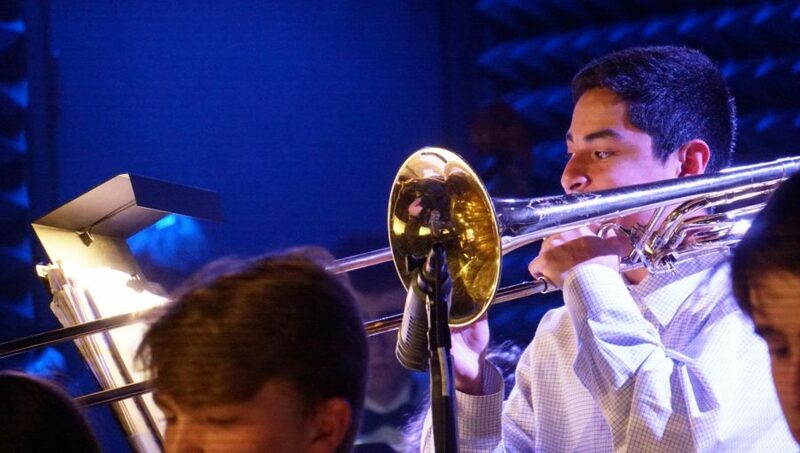 Junior trumpet player Clifton Pike said the experience was a far cry from a normal jazz band performance. We are pleased to share some of our favorite images from the concert this Tuesday for a very special edition of our #TuesdayTop10 weekly photo essay. 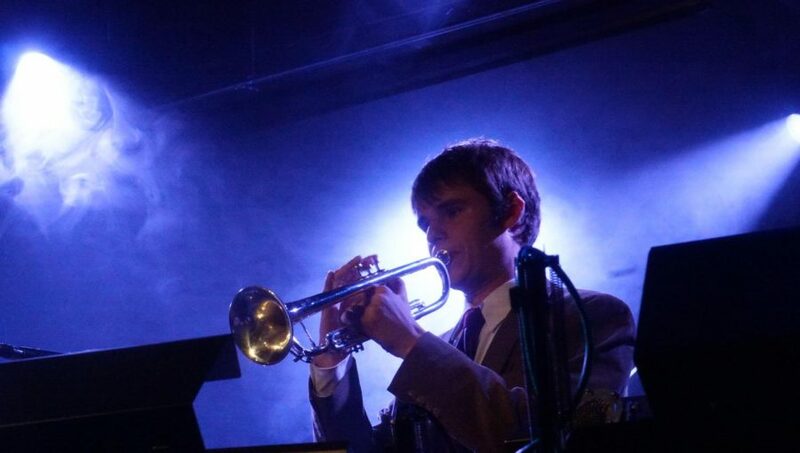 The spotlight shines down on trumpet player Joe Rodey as he plays a sweet jazz solo. 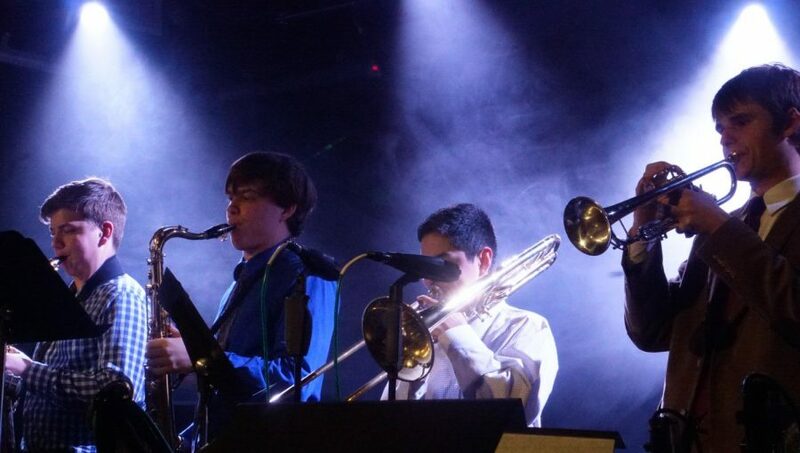 Along with being featured as a soloist in several of the band’s tunes, he also participated in the “Blue Knights” combo with four other members. 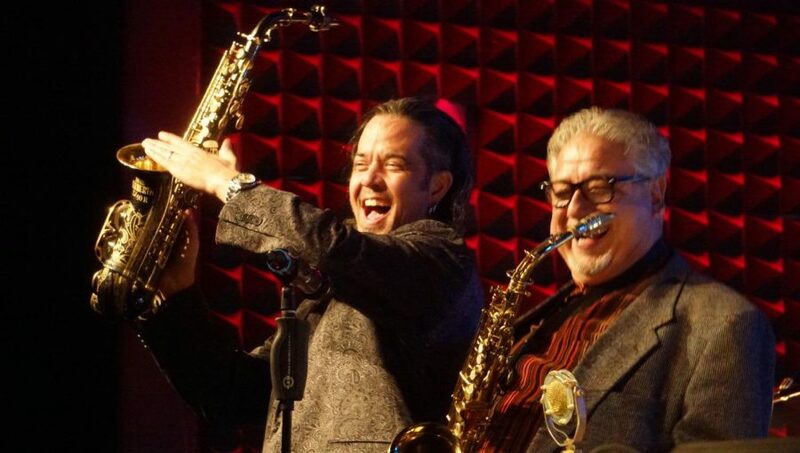 After making a surprise entrance and accompanying the jazz band for the end of the show, owner of Parker Jazz Club Kris Kimura lifts his saxophone into the air as mentor Joe Morales laughs along. The two men joined the band to play solos and read through the music as a last hoorah for the performance. They then went on to congratulate the band on a fantastic performance and told the audience that the young musicians there would soon steal their jobs because of how talented they are. Photos, videos and captions by Madelynn Niles. ARLINGTON — We entered the MAC to take pictures just like we do so often back in Austin on our home campus, but when we entered the Maverick Activities Center, we were not confronted with a stage filled with performing fine artists but rather a brightly lit, giant basketball court with two pairs of full-size basketball courts divided by a huge net and above them, on a second floor, an oval-shaped track where runners could run without fear of being hit by a stray bullet pass from the basketball players below. The scene was teeming with activity, but mere seconds after surveying the scene, only two steps past the entrance, Louis Deluca, a veteran Dallas photojournalist with an amazing reputation and even better portfolio of images, had found the subject that had the most potential: a father and son playing one-on-one on a half-court in the far corner of the gym. 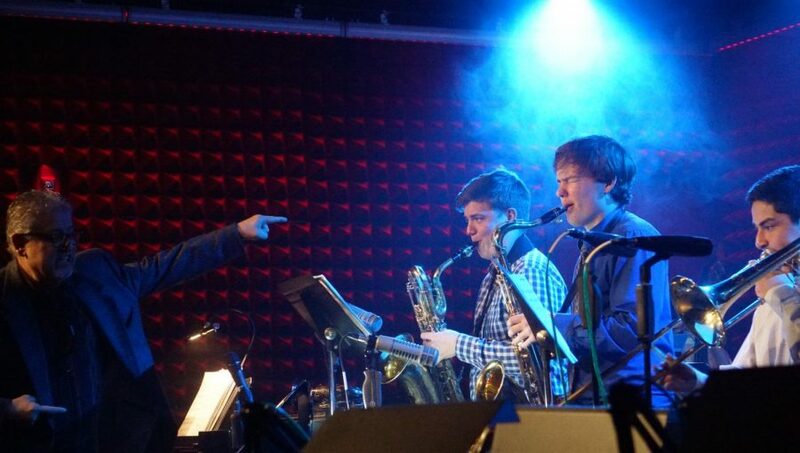 There, he said pointing to them playing, was an opportunity to tell a great story. We three MacJournalism photographers who were taking Deluca’s sports photography class at the Association of Texas Photography Instructors Winter Conference were not surprised that Deluca would find this subject compelling. At the beginning of the class that Deluca was teaching with fellow sports photography expert Steve Hamm, we were treated to a riveting slide show of Deluca’s best baseball images that was set to music. The slide show began and ended with a compelling image of a father and son sharing their love for baseball with each other. Father and son walk down tunnel to seats to watch 1999 season opener at Ballpark in Arlington. The youngster in this photo contacted me 15 years or so later, telling me how special this image was to him. Fathers +children+baseball+opening day=lifetime memories. 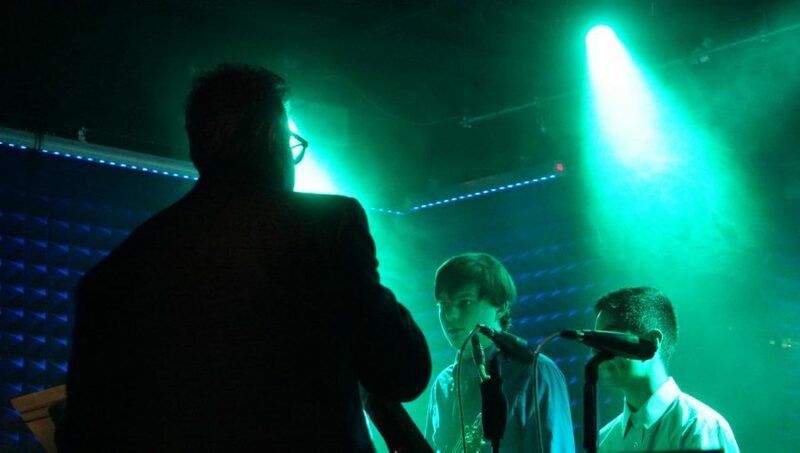 We were eager to prove Deluca right so we immediately went over to the father and son and asked them if we could take pictures of them playing. After the father granted us permission, we watched their game unfold and observed the complicated interplay of a dad sharing his love of sport with his son. 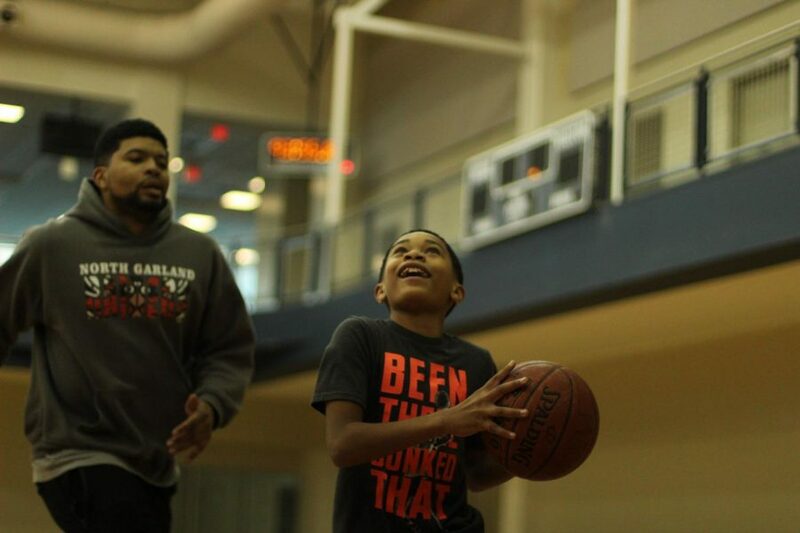 At times, the father would back off and let his son succeed at shooting, or driving to the basket, or rebounding. At other times, he would make the imbalance of their size, experience and playing ability unmistakable, swatting a shot out of the air with the ease of Godzilla crushing a plane without lifting his feet. At other times, the father would stop the game to teach his son one of the finer points of playing basketball. When the boy made a basket, his face lit up, and he would clap his hands quickly. It was a joy specific to this moment but also had a universal truth that anybody who has played a sport against their father would recognize and understand immediately. The boy would have many of these joyous moments, but it was clear as the game unfolded that they would be isolated moments in a game the father was destined to win. Afterward, we talked with the father and son and asked them if they wanted copies of the photos you see here. We asked the boy if he’d even beaten his dad. He shook his head no. And then the father jokingly boasted that he never would either. 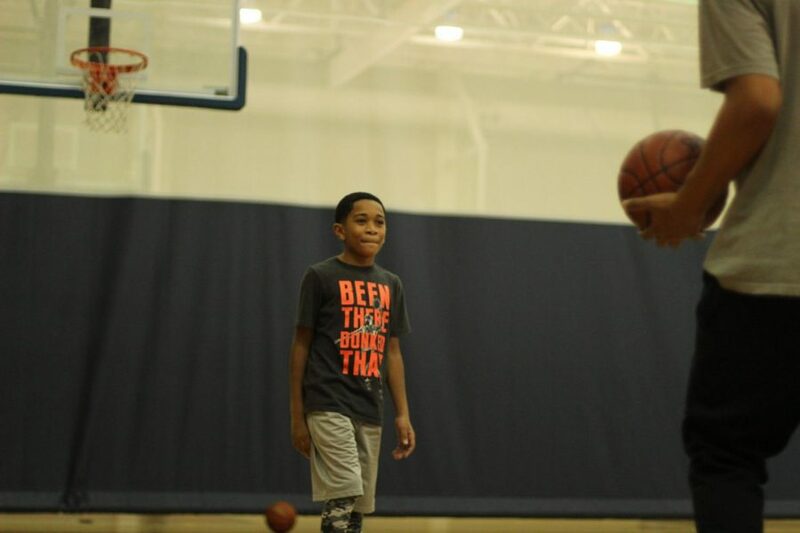 Without hesitating, we told the boy that time was on his side and that he just needed to keep playing. We are pretty sure he will. He was beaten but not discouraged. Another game. Another day. Some day, another outcome. 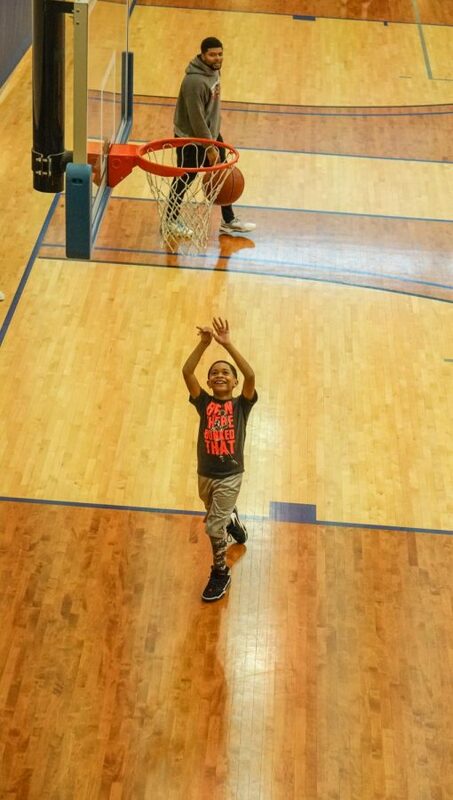 As dad puts on the breaks slightly, as son accelerates to the basket hoping to shoot before the block attempt he is anticipating can get to him. 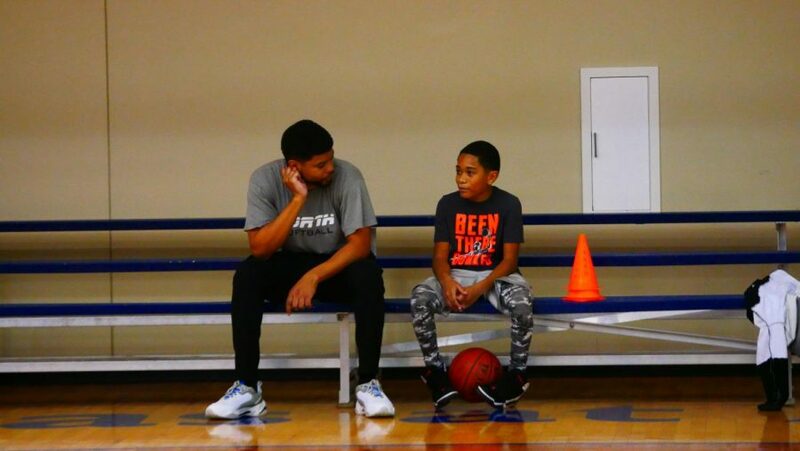 One way for the son to get a shot off is to let it fly from beyond the 3-point arc. To get the long-distance shot off requires the son to launch into the shot with his entire body. Son’s slight grimace betrays his determination to succeed and perhaps his awareness that defense is futile against his dad’s superior size, experience and ability. 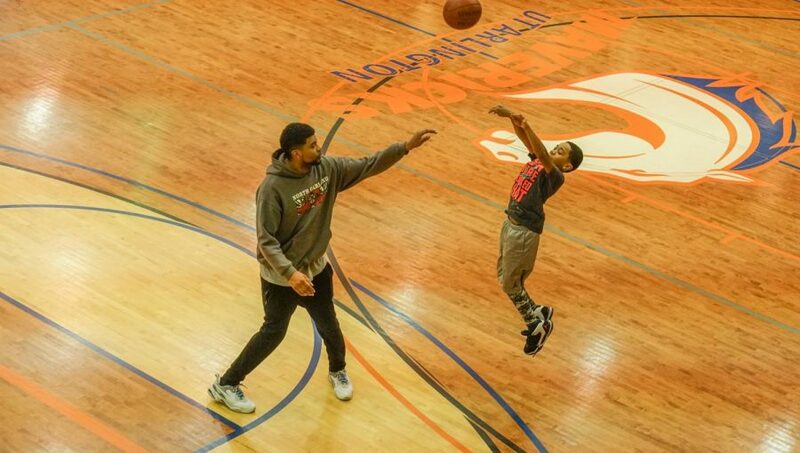 Dad pulls no punches on his son’s shot attempt this time, virtually palming it out of the air. 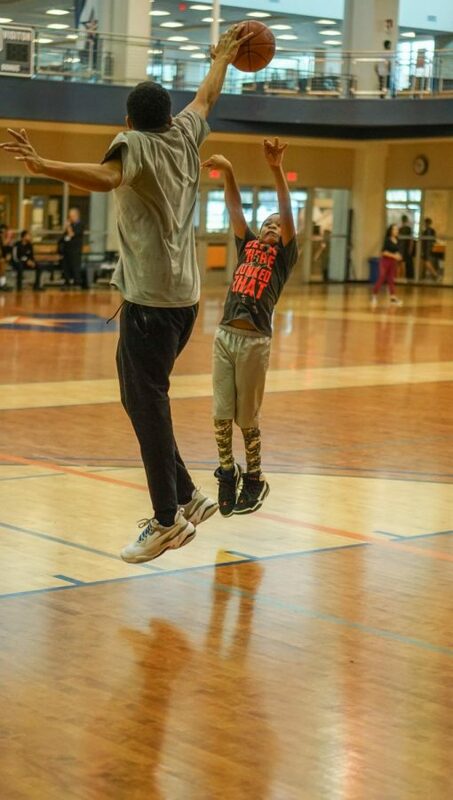 Like dads playing against their sons across all times and places, this dad alternated between brutally tough D and letting his son shoot uncontested. 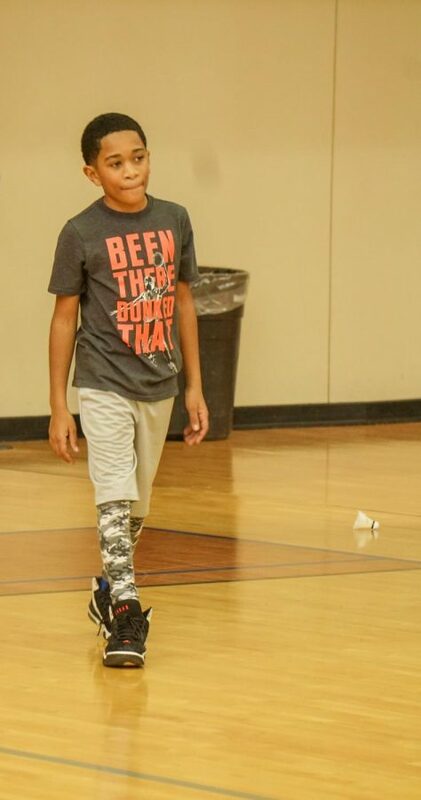 Son hits the hardwood after his most recent shot attempt was soundly rejected. His smile makes it clear he is not giving up any time soon … or ever. Son is all-in in this effort to retrieve a lost ball. The ball on the floor is one time the son might have an advantage, but his effort to gain possession falls short this time. Son wears a look of determination during a stoppage in play. 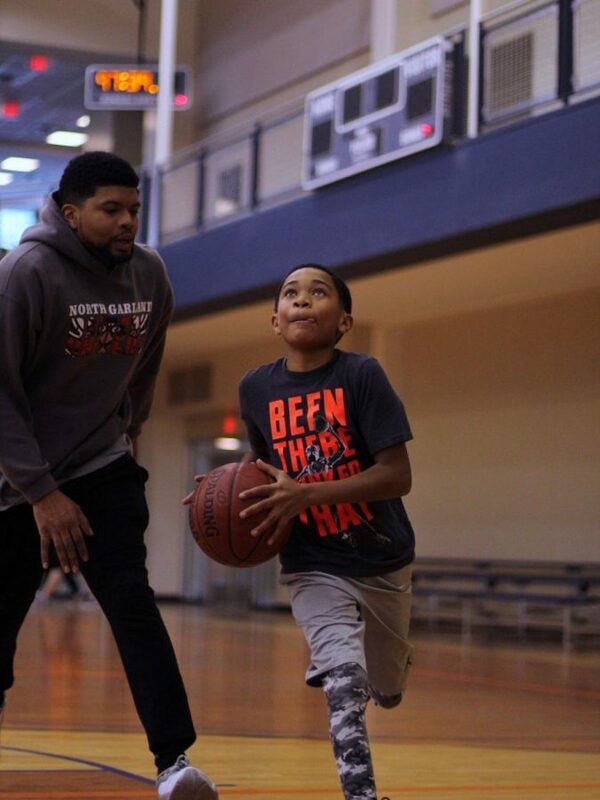 The struggle to beat your dad in basketball is real. Like the uncontested shot he’s taking on this possession, the joy of having a little space to shoot is impossible to miss. 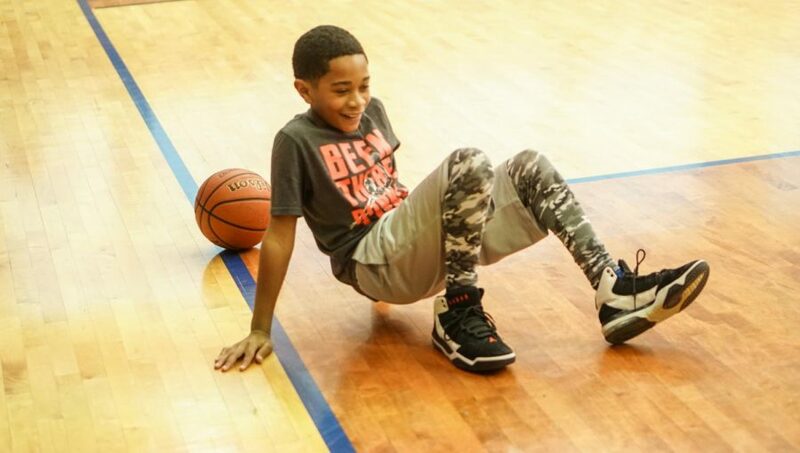 Son adopts a slight Michael Jordan-esque expression as he drives the basket a few steps ahead of his dad, who decided this possession was one for matador (not monster) defense. With today’s games over, father and son share some rest and conversation before departing the Maverick Activities Center. 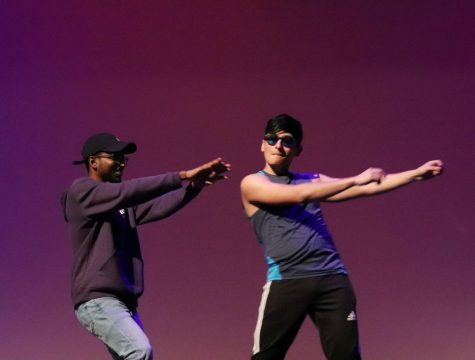 An annual hit to raise money for the class of 2019 prom, Student Council hosted the Mr. McCallum pageant on Saturday the 16th in the MAC theatre. The 12 participants went through three rounds: an on-stage interview, a talent portion and a swimwear competition. First up in the interview portion of the pageant, Luke Thiessen explains why he would like to be the class of 2019’s Mr. McCallum. Joy Saha and Jack Rodriguez kick off the talent round with a choreographed dance to “Despacito”. 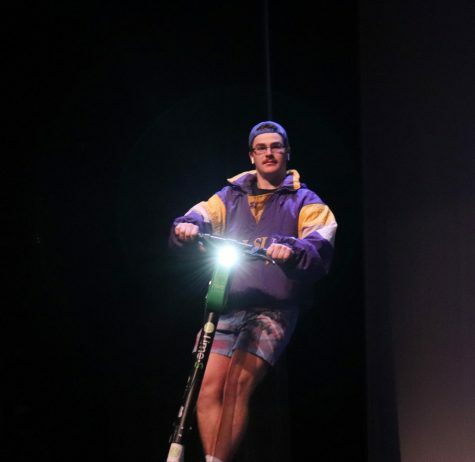 Complete with personal sound effects, Noah Cooley shows off his scooter skills by riding a Lime across the stage. 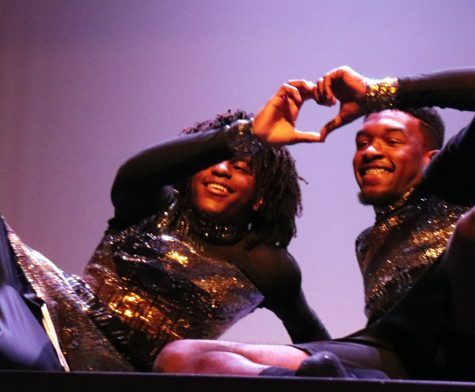 Gabe Williams and Deron Gage wear sparkling costumes as they perform a dance to Sia’s “Chandelier”. 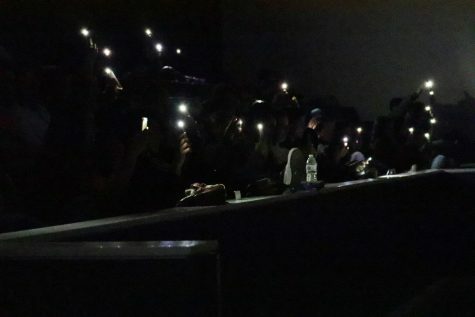 The audience uses their phone flashlights to light up the stage while Quin Aldredge and Robert Gossard perform an original rap about their McCallum pride. 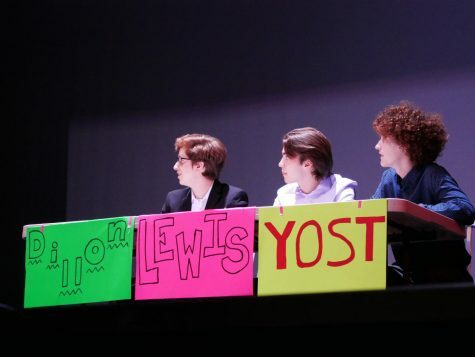 Dillon Guerrero, Lewis Hughes and Michael Yost play a McCallum-themed version of “Jeopardy” hosted by Xavier Zamarron. Lewis Hughes and Dillon Guerrero show off their different approaches to Hawaiian-style swimwear. 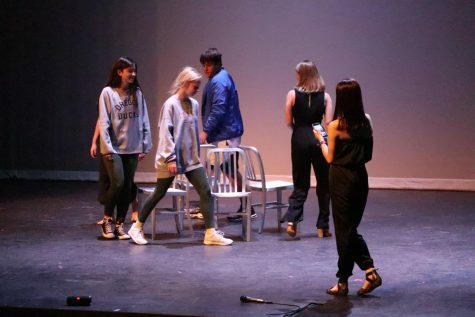 While the contestants changed into their formal wear, audience members competed in a cutthroat game of musical chairs to win a comped prom ticket. As the last audience member standing, senior Claire Caudill received the ticket. All contestants present a choreographed dance in their swimwear before changing into their evening attire for the announcement of winners. 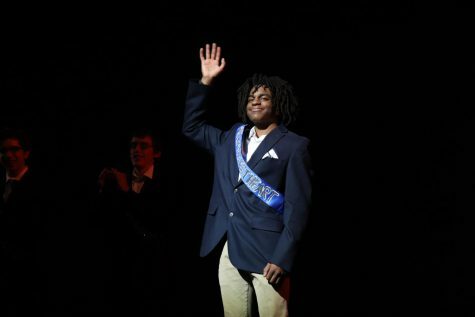 MR. MAC: Gabe Williams waves to the crowd as he is announced the winner of the Mr. McCallum pageant. In second place was Robert Gossard and Luke Thiessen took the title of Mr. Congeniality. 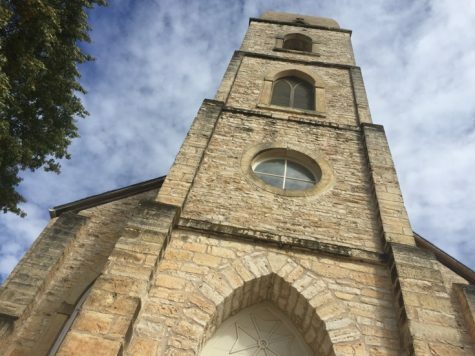 In this week’s #TuesdayTop10, guest photographer Bella Kisler takes you to Fredericksburg, a unique Texas town less than an hour away from Austin. 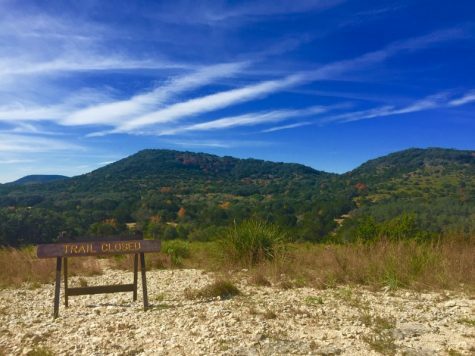 Located in Central Texas about two hours away from Austin, Fredericksburg is known for it wineries, its natural scenery, its German heritage, its great food and much more. In this photo you can see a sign the welcomes visitors as they first cross into the town. The sign says welcome in German, which is established upon entry the German heritage and culture of the town. 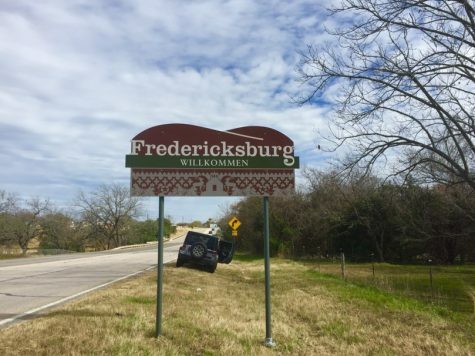 “From the time you enter Fredricksburg you just feel like you are in a completely different realm, not in Texas at all” said Joe Brickson, a frequent visitor to Fredericksburg. On the road again: Fredericksburg is also known for the great views while driving along the countryside. In the photo, you see an old rusty tractor in the middle of nowhere with rusty broken down fence in the foreground. 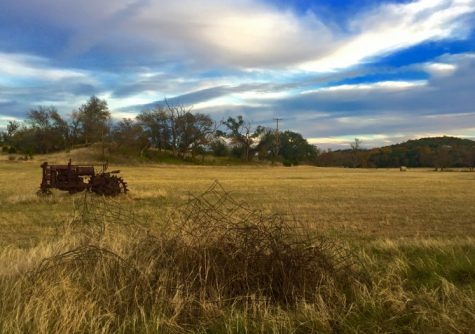 Along with the commonly known town of Fredericksburg, there is also a lot of country roads throughout Fredericksburg and the surrounding areas. Christmas Time! 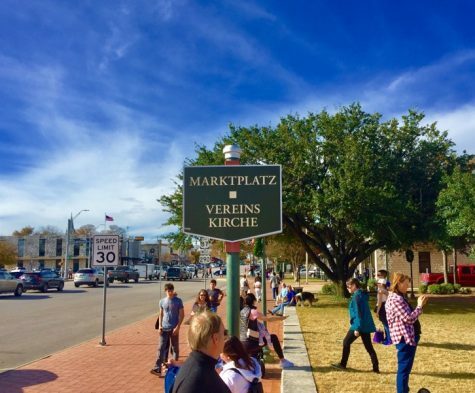 As for the city life in Fredericksburg, it is always very lively, the streets filled with people, musicians playing on the streets, and much more. If you go in the afternoon, there are many unique shops selling very interesting things. 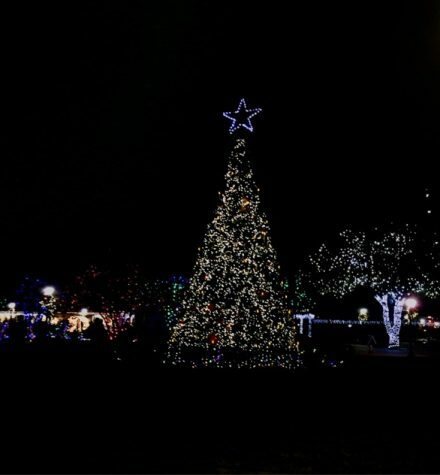 This photo shows the central park of Fredericksburg around Christmas time, when they put up decorations on all of the trees and erect a giant Christmas tree up in the center of the park, along with a temporary ice skating rink. 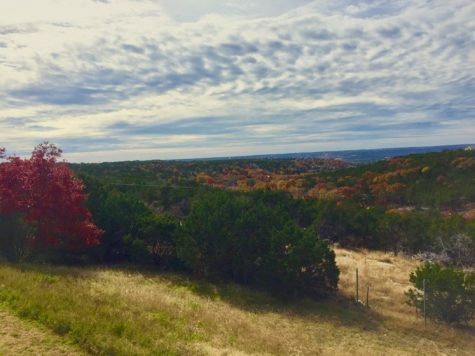 On the Road Again: Right off many of the Fredericksburg highways in the fall, you can see many leaves on the trees that leads to a beautiful sight while driving down the interstates. The scenery is unbelievable; you can’t even begin to imagine it, miles on miles of orange, red, and yellow trees, that seemingly go on forever. German Heritage! 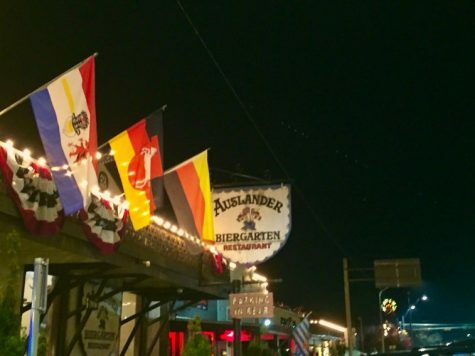 A restaurant in downtown Fredericksburg called Auslander Biergarten serves authentic German food and offers a very unique environment inside. There are many other German restaurants around the area in addition to this one, that are equally as good. It really shows off the German heritage of the town with all the German shops and restaurants around the area. Structures of Fredericksburg! There are many beautiful buildings and churches scattered throughout town. This is a photo of one of the churches, located in the middle of downtown. This picture is a very interesting angle on the temple of the church, which leads to making the church look very large and powerful. The Wall of Pins! There are many unique shops spread throughout Fredericksburg. And this shop in particular decorates their shop in a very unique way. The shop itself is a shop that sells all types of spices, jarred goods and much more. The store is an outdoor store. It is not inside walls and glass; instead, anyone walking by can just casually stop by. Rollin’, Rollin’, Rollin’ in the river! 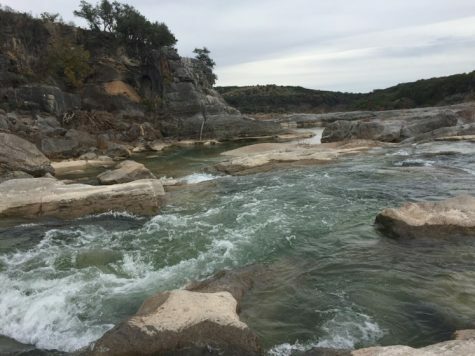 This photo from Pedernales State Park is of the river leading up to the official Pedernales Falls. It is a beautiful sight, even on a slightly overcast day. On a warm day, it would also offer a great swim. The MarketPlace! Located down in Fredericksburg, it is the center park of the town. Here is a sign, that again, shows the German heritage of the town. It says marketplace in German, on more example of the German heritage that is woven throughout the town. 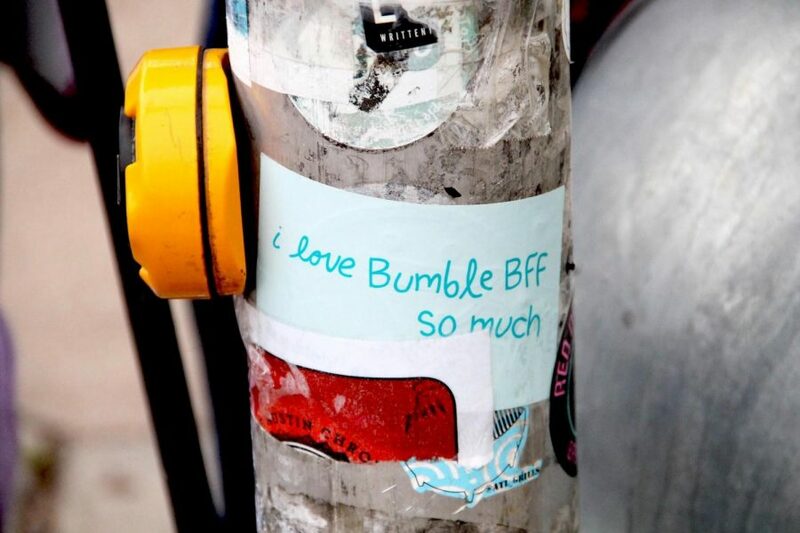 Photos and captions by Bella Kisler. A broken family. A broken home. A broken heart. This is where Shane sleeps and stores his belongings. 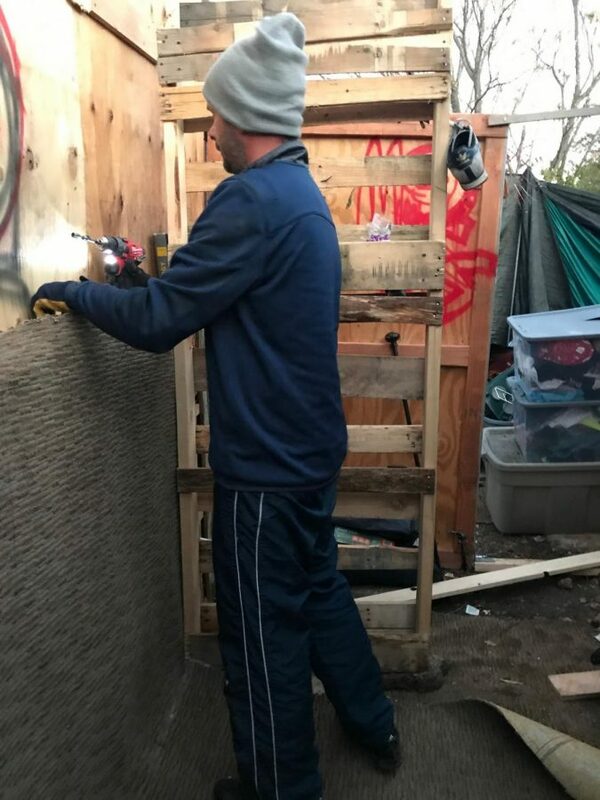 He has put together this room with wood and materials he has found in dumpsters, and he was given a mattress by his friend, Toni. When Shane hit a breaking point with his mental health, he removed himself from the world of professional employment for fear of not being able to keep himself together emotionally in front of clients or coworkers. “I found myself with a bigger hole in my heart than I’ve ever been able to fix,” Shane said. He used to have a dog that he said kept him sane, his “trusty Blue Bell” that was his everything. When he got arrested for selling illegal items, his friend who had promised to take care of his dog gave her to the shelter, and she was adopted by someone else. When he got out of jail, he had nothing. Not having his dog and not having human interaction every day makes him extremely lonely. 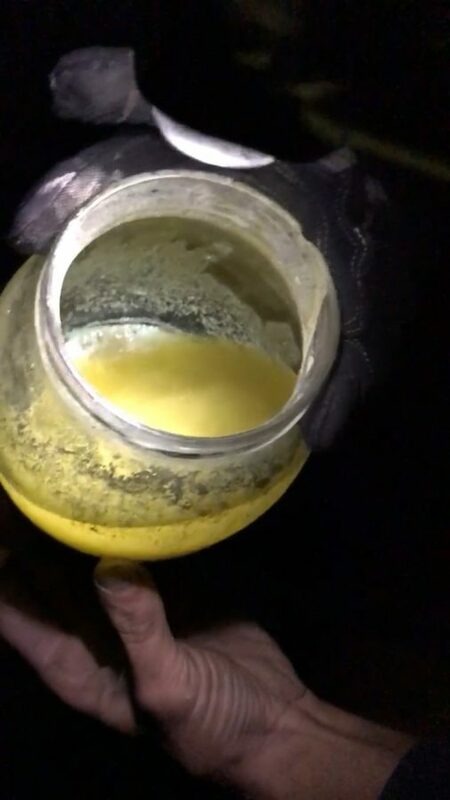 A jar full of gold that Shane has extracted and liquefied. He extracts gold from anything that has ever been plated with gold, touched with anodize, electroplated, or dipped in gold. He takes gold from a solid form, turns it into a liquid form, then back to a solid form using different chemicals and heat. 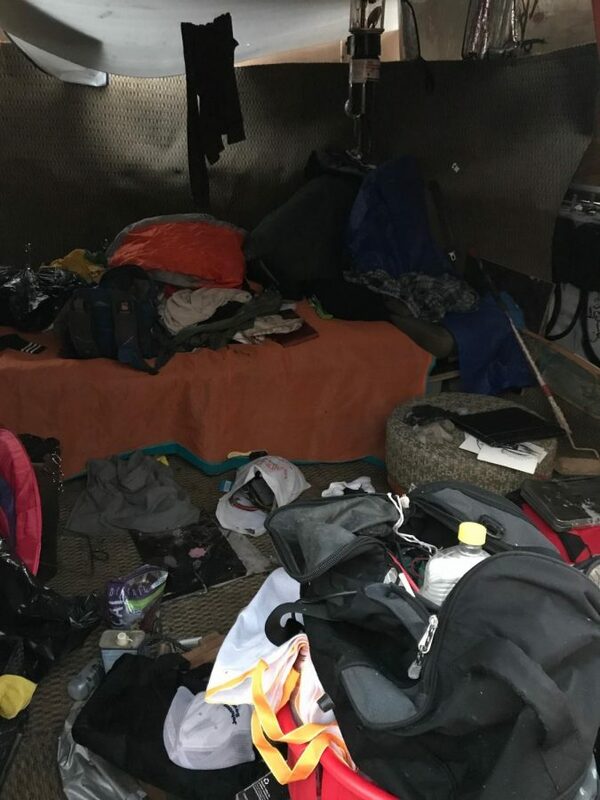 He is doing this to be able to earn enough money to buy a truck, a piece of land, and hopefully be able to pay the people that took his things in order to get them back. He also wants to send money to his 15-year-old son whom he hasn’t seen for many years. “That’s my greatest fear in life. I don’t even know how to approach my son and tell him I’m sorry,” Shane said. He learned and continues to learn about extracting gold from researching about it at the public library. 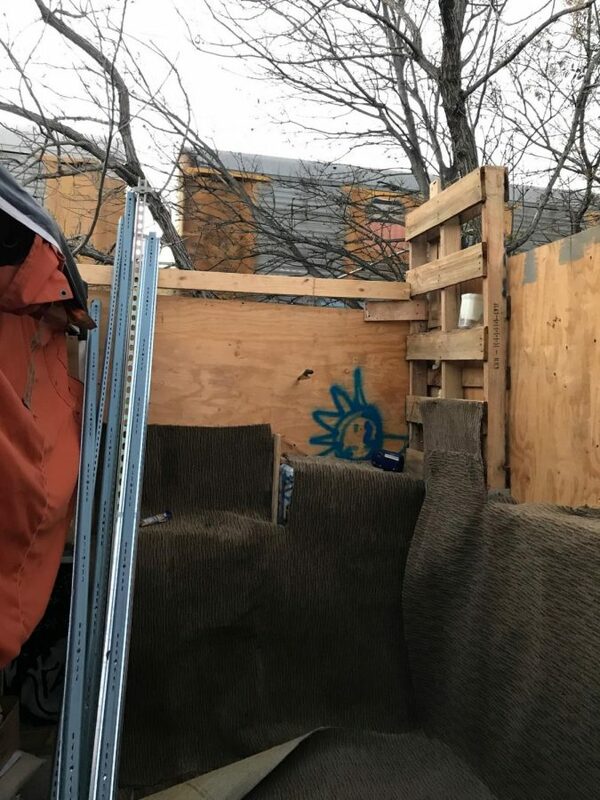 This is the back of Shane’s shack. He put pieces of cloth and wood up with nails and a screwdriver for privacy. Shane’s days don’t run on a consistent clock. “My days are nights, and my nights are days,” Shane said. He doesn’t wake up at 7 a.m., go to work, come home at 5 p.m. and “watch cartoons and eat cereal.” Shane spends his days researching and learning about gold extraction and zero waste lifestyles at the library. 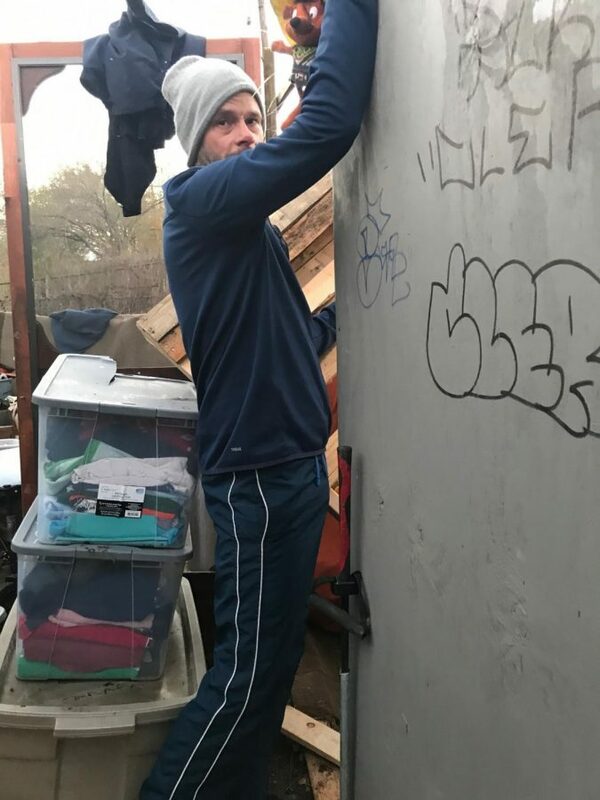 He believes “one man’s trash is another man’s treasure.” He spends his days “lerping,” which is when you are high on drugs and you jump into people’s trash cans looking for things that are of no value to that person. He re-purposes, up-cycles, up-scales, recycles, or turns items into something of use to him. On a daily basis, Shane stays awake for 20-40 hours then sleeps for four to six hours. Shane is nailing carpet to the wood as an insulator in an attempt to make his shack warmer. 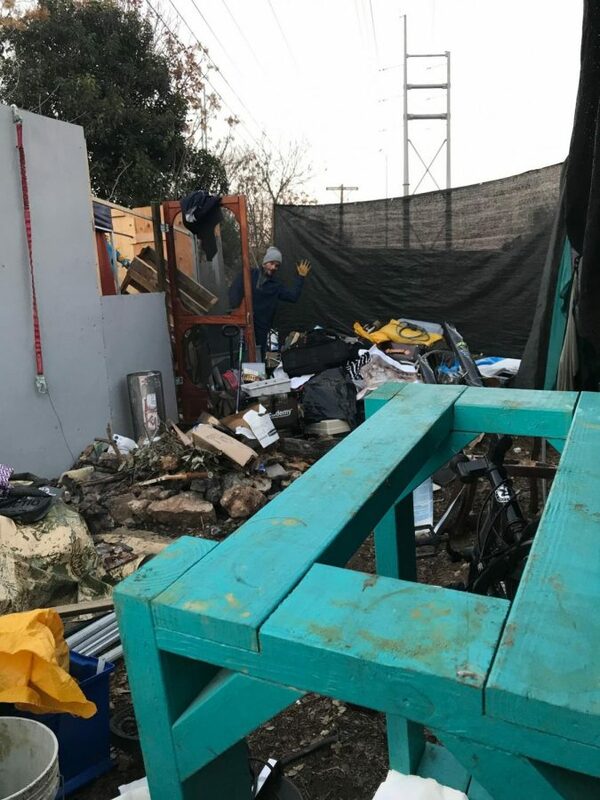 Shane has built his “home” from discarded items that he finds in dumpsters and continues to gather materials daily to use for his renovations. Even after spending many weeks gathering materials and working to improve his place, it still doesn’t keep him safe from intruders or the weather. “It’s frustrating to work so hard and still not feel comfortable or safe,” Shane said. 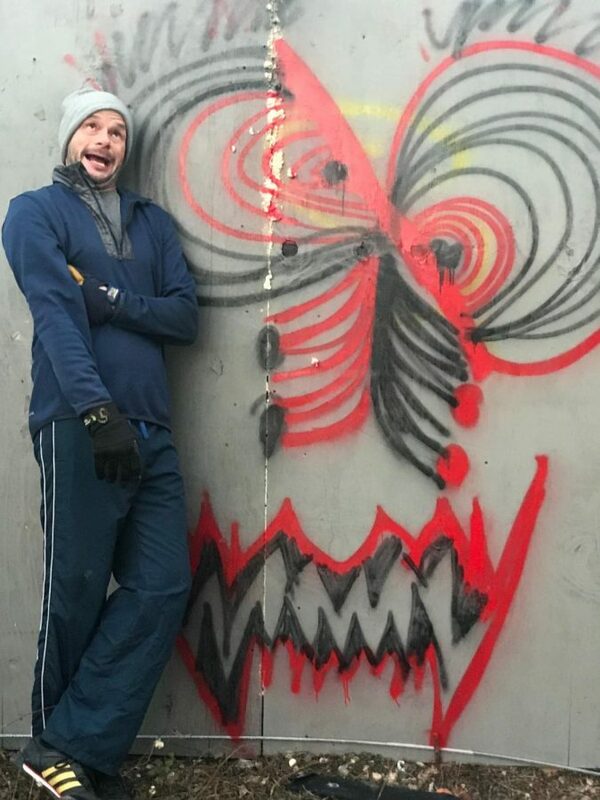 Shane mimicking the face he spray-painted on his wall. Shane paints as a creative outlet for himself and a way to pass the time. Painting is a way for him to express emotion in a positive way. Shane collects paints that other people have discarded and has been given painting materials by his friend, Toni. “I don’t have a lot of money, but I have a lot of time to create things that I love,” Shane said. Shane is hanging up a stuffed animal he found as a decoration for his living space. He is standing in front of the boxes he keeps his clothes in to keep them from getting wet. Shane has himself stuck in a box, “I haven’t taken advantage of a lot of the opportunities that I would be able to have paid for by the state if I got a formal diagnosis of bipolar disorder.” Shane said.” As an army veteran and someone with a mental illness, he could be eligible to receive monthly financial support, housing, food stamps and health care through government programs if he followed through with the application and eligibility requirements for these services. 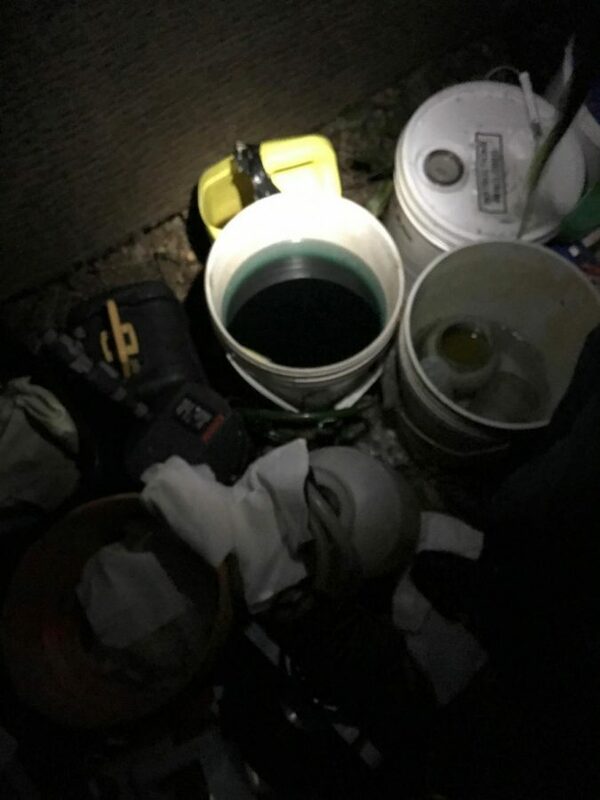 This is where Shane makes his “alcohol.” He uses gel, sanitizer, and sanitization materials and presses them down in a bucket which leaves pure ethanol and ether at the top which he drinks to get drunk. Getting drunk helps to numb his emotions and gives him a break from the stress of his reality. “When you can’t afford alcohol you go out and steal hand sanitizer from businesses,” Shane said. All photos and captions by Maeve Walsh.